Saddle nose deformity or nasal dorsum collapse is an uncommon, but devastating deformity that may require a rhinoplasty or nose job. Saddle nose deformity is due to loss of cartilage support in the mid nose, associated with loss or weakness of septum cartilage. In a mild form, saddle nose deformity causes depression of the middle third of the nose, only visible on profile views. In more severe cases, significant collapse of the nasal dorsum leads to upward rotation of the nasal tip, shortening of the nose, and nasal obstruction. The nasal deformity can lead to nasal obstruction, self-consciousness, withdrawal and depression. Nasal reconstruction in saddle nose sufferers can be life changing. Nasal collapse and saddle nose deformity can be caused by various etiologies, including: nasal trauma, previous nasal surgery, autoimmune disorders (Wegener’s granulomatosis, relapsing polychondritis) and sniffing of recreational drugs. Prior to repair of saddle nose deformity, one should establish and treat the underlying cause of the nasal collapse. This may necessitate biopsies, blood tests or consultation with specialists. 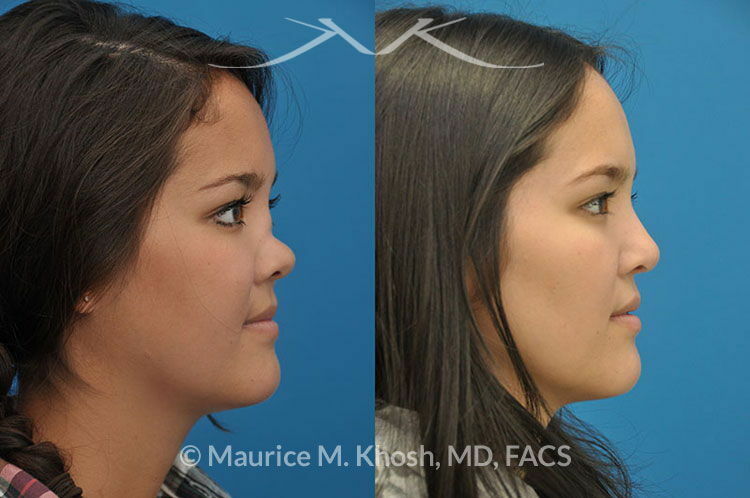 Dr. Khosh is vastly experienced in treating patients with saddle nose deformity. 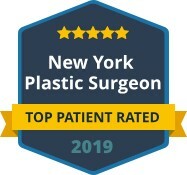 He is well versed in all techniques for saddle nose reconstruction including: filler injections, cartilage grafts from the ear and the rib, bone grafts from the skull and manufactured implants. 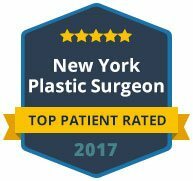 Dr. Khosh treats each patient individually by tailoring the reconstructive options and the approach for repair (open rhinoplasty vs. closed rhinoplasty) to the extent of the deformity and the underlying cause of the collapse. Patients, who seek consultation for saddle nose deformity in New York are encouraged to bring photographs that display their nose in its healthy state, prior to collapsing. During the consultation visit, Dr. Khosh uses computer imaging to allow clear communication and discussion of the intended outcome from nasal reconstruction. In the visit, the treatment options and the benefits and shortcomings of each choice are discussed. If you or a loved one suffers from nasal collapse or saddle nose deformity, we invite you to contact us today to schedule a consultation with Dr. Khosh. This 17 year-old girl had developed saddle nose deformity from Wegerner’s granulomatosis. She sought consultation for repair of nasal collapse. Her nasal reconstruction entailed cartilage grafting from the rib. 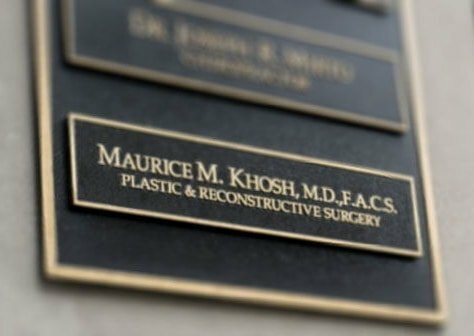 Disclaimer: These are actual results for patients of Dr. Maurice Khosh. Plastic and cosmetic surgery results can vary between patients. Does insurance cover the cost of saddle nose deformity repair? Most insurance companies consider the surgical repair of a saddle nose deformity to be reconstructive rather than cosmetic and therefore cover the costs of surgery. What happens if you take a piece of cartilage from my rib to reconstruct my saddle nose? Currently, rib cartilage grafting is my preferred technique for repair of a saddle nose deformity. A one to two inch incision in the crease below the breast allows access for removal of a piece of rib cartilage. The incision site is closed meticulously, and the scar is barely perceptible. Pain and discomfort resolve in approximately 10 days. Will my ear look different if you take ear cartilage to repair my saddle nose deformity? I harvest ear cartilage through an incision behind the ear. Cartilage harvest is confined to the concave central aspect of the auricle, known as the conchal bowl and the concha symba. There will be no change to the appearance or function of the ear. The incision site is completely hidden. How long does the surgery for repair of a saddle nose deformity last? Although each case is unique, the average duration of surgery for saddle nose deformity is 3.5 hours. Can I go home after surgery for saddle nose deformity? In surgical procedures where rib cartilage was used for repair of a saddle nose, patients typically stay in the hospital for one night. Other modalities of saddle nose repair are performed as outpatient surgeries, and patients can go home after surgery. Will I have packing in my nose after surgery for nose collapse? No. We do not use packing inside the nose following saddle nose repair. What is the difference between the open approach versus the closed approach in nasal valve repair? Nasal valve collapse can be preformed via the closed (endonasal) or the open (trans-columellar) approach. Both approaches entail incisions inside the nostrils. The open approach adds an incision across the columella (the skin between the two nostrils). Open approach affords better visualization of the nasal tip cartilages and allows for precise placement of cartilages and is often preferred for nasal valve repair. What causes the nose to collapse in a saddle nose? Normally, the septum (wall in the middle of the nose) provides supports the bridge of the nose. If the septum becomes weak due to loss of cartilage, then it can default in it’s function as supporting strut for the nasal bridge. The bridge of the nose will then sag and may eventually collapse. How is a saddle nose repair different from a typical rhinoplasty? The goal in most rhinoplasties is lowering the bridge of the nose and/or refining the appearance of the nasal tip. This is usually accomplished by shaving bone and cartilage, and using stitches to bend the nasal tip cartilages. 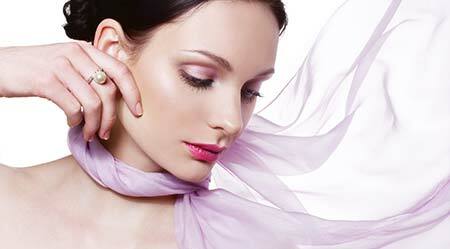 Saddle nose repair is a more complicated reconstructive procedure. Often times, rib cartilage must be shaved into precise size and shape before placement into the bridge of then nose and the nasal tip area. Saddle nose repair requires a greater level of surgical skill and expertise. Most patients who undergo repair of saddle nose deformity are singularly concerned about the appearance of the nose. Although other cosmetic procedures such as blepharoplasty, chin implantation, or neck liposuction could be performed simultaneously, these secondary procedures are not commonly sought.